On 5 June, a 4-year initiative launched in Soubise to prioritise and invest in ecosystems that reduce disasters related to climate change. Led by The Nature Conservancy and the International Federation of the Red Cross and Red Crescent Societies (IFRC), the Resilient Islands project combines cutting-edge conservation science with expertise in disaster risk reduction to develop tools and test natural solutions that protect coastal communities in Grenada, Jamaica and the Dominican Republic. Funded by the German Federal Ministry for the Environment, Nature Conservation and Nuclear Safety, Resilient Islands will collaborate locally with the Grenada Red Cross Society and the Ministry of Climate Resilience, the Environment, Forestry, Fisheries, Disaster Management and Information to integrate nature-based solutions into development plans, in order to provide physical protection from storms and reduce disaster recovery time through proactive environmental management. As small island developing states grapple with the effects of climate change, many islands are reaffirming their commitment to climate adaptation and seeking new ways to protect coastal areas from flooding, erosion and other impacts which disproportionately put coastal communities in danger. Caribbean islands are among some of the first to suffer the impacts of climate change due to their low-lying infrastructure, their location within the hurricane belt and, their reliance on coastal ecosystems for tourism and fishing. Resilient Islands promotes the recognition of coastal ecosystems, such as coral reefs and mangroves, as national resources worthy of investment. These habitats not only support the fishery industry and enhance tourism, but they also provide invaluable protection to homes and critical infrastructure. 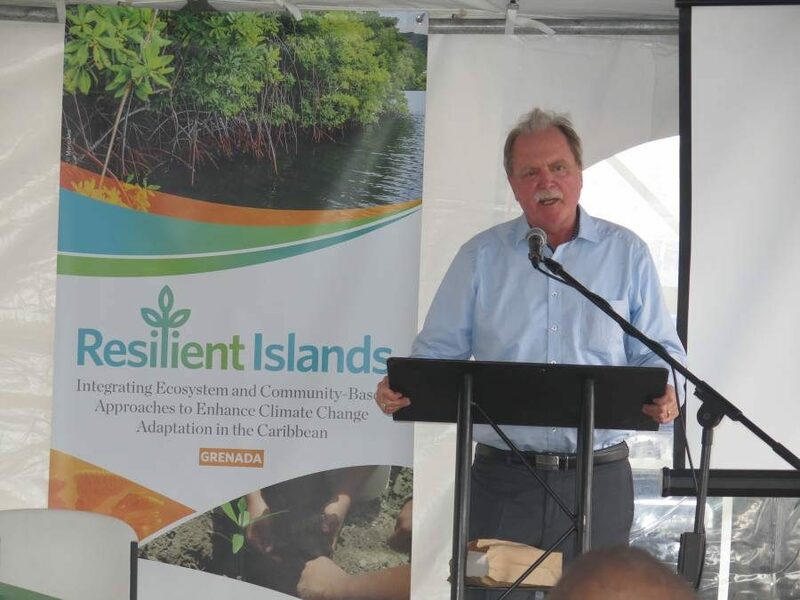 In Grenada, the Resilient Islands project will be implemented specifically within the Grenville Bay Area communities of Telescope, Grenville, Soubise and Marquis, which have all been identified as highly vulnerable to the impacts of climate change. Nature-based interventions will include a remediation plan to improve water quality in the bay, environmental awareness activities expanding on the success of last year’s Reef Week, and the construction of a climate-smart fisher facility in Soubise. “We are combining science and disaster risk management to ensure that at the end of the day, the communities are the beneficiaries. At the end of the day we will have a holistic and resilient Grenville Bay community,” said Nealla RS Frederick of The Nature Conservancy. 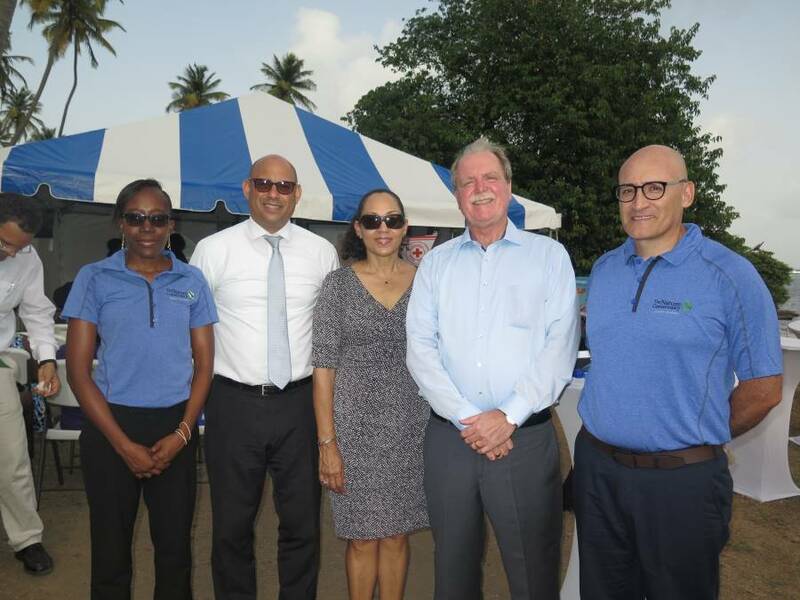 “We give the assurance that we will continue doing our best to ensure that our environment, our coastal region is taken care of in the Grenville area and it is going to be a model and an example that others can follow,” said Terry Charles, Director General of the Grenada Red Cross. The other project countries, Jamaica and the Dominican Republic, will replicate steps already completed in Grenada, by first assessing their most vulnerable communities and using data from The Nature Conservancy’s award-winning interactive mapping website to select target areas. This tool, among others produced under the project, will help government officials and community members assess their risks, visualise benefits from coastal ecosystems, and decide on specific nature-based solutions to implement within targeted communities. The project is part of the International Climate Initiative (IKI). The Federal Ministry for the Environment, Nature Conservation and Nuclear Safety (BMU) supports this initiative on the basis of a decision adopted by the German Bundestag.